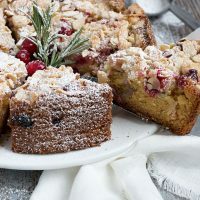 Delicious fresh (or frozen) cranberry coffee cake, topped with an almond streusel. Prepare the Almond Topping: In a medium bowl, stir together the flour, sugar, cinnamon and salt. Pour in the melted butter and stir until moistened and clumpy. Pour in the flaked almonds and with fingers, mix together until crumbly. Place bowl in the fridge while you prepare the cake. Preheat oven to 375F. Grease and 8-inch springform pan and line the bottom with a round of parchment paper. Set aside. In a large bowl with an electric mixer or the bowl of a stand mixer fitted with the paddle attachment, beat together the butter and sugar until light and fluffy, about 2 minutes. Add the lemon zest and juice and mix to combine. Add the eggs one at a time, beating well after each addition and scraping down the sides of the bowl as needed. Add the almond extract (or vanilla) and mix to combine. Add the flour mixture alternately with the sour cream and mix until well combined. With a spoon, gently stir 1 cup of the cranberries into the batter. Pour batter into prepared pan and smooth top. Scatter remaining 1/2 cup of cranberries over the top. Sprinkle almond topping over the top. Bake in preheated oven for 45-50 minutes, or until a tester inserted in the centre comes out clean. Let cool in pan for 5 minutes, then run a knife around the outside and remove the outer ring. Transfer cake to a cooling rack, sliding off the base of the pan (with the parchment) and onto the cooling rack. Let cool completely.